Collins was born in Seattle, Washington, where she spent the first ten years of her life. Her father took a job in Denver in 1949, and the family moved to Colorado. Collins studied classical piano with Antonia Brico, making her public debut at age 13, performing Mozart’s Concerto for Two Pianos. Brico took a dim view, both then and later, of Collins’s developing interest in folk music, which led her to the difficult decision to discontinue her piano lessons. Years later, when Collins had become internationally known through her music, she invited Brico to one of her concerts in Denver. When they met after the performance, Brico took both of Collins’ hands in hers, looked wistfully at her fingers and said, “Little Judy—you really could have gone places.” Still later, Collins discovered that Brico herself had made a living when she was younger playing jazz and ragtime piano (Singing Lessons, pp. 71–72). 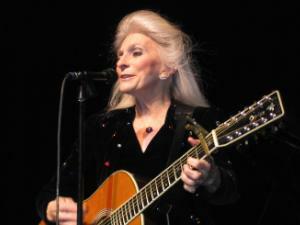 She also had the fortune of meeting many musicians through her blind father, a Seattle radio program host.